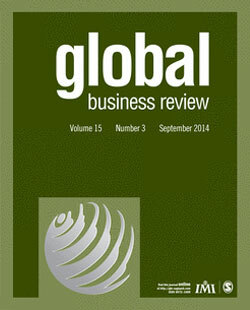 Global Business Review provides an outlet for research and scholarship on management-related themes and topics. It publishes articles which are of a multi-disciplinary, interdisciplinary, and internationally significant nature. Thus our major objectives are to attract thoughtful scholarship that matters to corporate and other institutions, for their overall development, as well as to society at large. We encourage contributions from around the globe, with special emphasis on emerging economies. The journal includes empirical, conceptual and methodological articles across the full range of business and management disciplines, including general management, human resource management, organizational behavior, management development, accounting and finance, business ethics, equality, diversity and inclusion, strategic management, marketing, operations management, technology management, information technology, business economics, public sector management, management of non-government organizations and research methods. Among the regular features are Chief Executive Officer’s Forum, Policy Debate, Review Articles and Book Reviews. This is a refereed journal. Papers are reviewed by eminent academicians and professionals from various places of the world.